Two Year LiFE Cell Warranty, the Best in the Business! This 3rd generation LiFE battery represents a tremendous leap in technology from our previous designs. This new rechargeable battery pack is rated at 12.8 volts and 20 amp hours. It may be used with our PowerMax Ultra, PowerStar LiFE (rack mount version), PowerStar EuroLiFE, or our PowerStar LiFE Zeus. This new design is now equipped with a charging port for use with our optional PSC Pelican LiFE Battery Charger. The small size and weight of this battery make it perfect for powering small cart setups as well as for using as an add on battery to our bigger power systems. This new Pelican LiFE battery is built in a rugged Pelican 1150 case that measures only 9.25” x 7.5” x 4.375” (23.5cm x 19cm x 11cm). The entire product weighs just 7.25lbs (3.3Kg). Our design uses special cells allowing higher than normal charge and discharge rates. 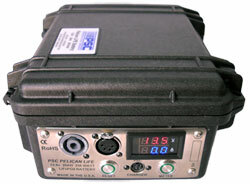 The Pelican LiFE battery is rated at up to 25 amps of discharge or charge current. Internally it contains active electronics to protect the cells against deep discharge, overcharging, excessive high discharge rates (short circuit) and excessive charging rates. In addition, the electronics provide cell balancing while charging for longer cell life. Included is a built-in Battery Volt Meter and Output Current Meter to provide you with useful information, both SpeakON and 4 Pin Female XLR output connectors and a battery protection re-set switch. Additionally, we warranty our LiFE cells to a full two years, the longest in the industry ! 9.25" x 7.5" x 4.375"